I had trained MMA (mixed martial arts) at MuayFit for around nine months while attending a few Muay Thai beginner classes at Sparta Tiger Muay Thai before taking a break until I was invited by Nuffnang to this pre-event promotional workshop for bloggers at Dragon MuayThai Club in Kuala Lumpur. And then there I was, training the basic techniques and forms again that I never thought I’d lose in such a short period of time. This light two-hour beginners workshop made me feel like training martial arts again soon, thanks to their trainers and great facility. I personally liked the place a lot. Very spacious. Smells hygienic. The floor mat is my favourite kind, not too soft with a little grip even when its wet. The ventilation is excellent too without any need of air conditioning. Plenty of punching/kicking bags of all sorts hanged. There’s mirror too on the entire stretch of the wall of the one side, something that not all Muay Thai gyms have (it’s important to be able to see your own form when practicing the techniques). 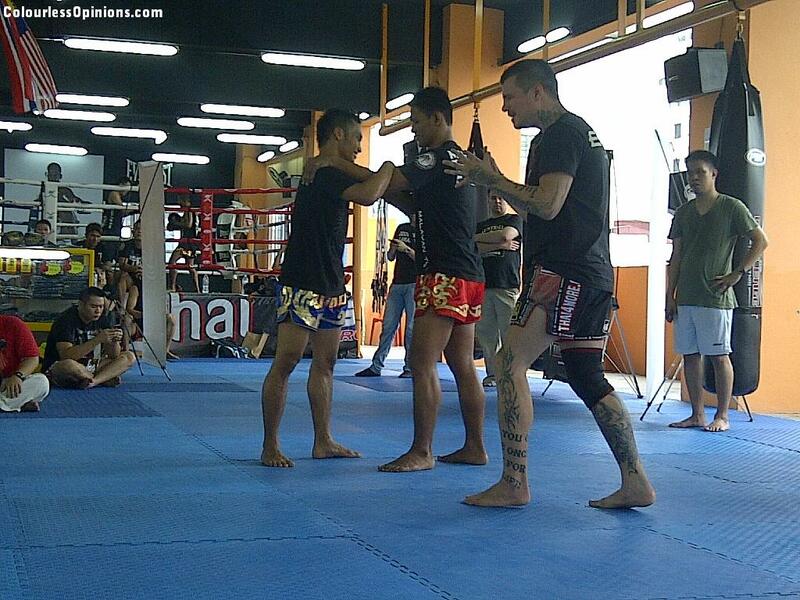 There’s a strength/weight training gym on one end and a Muay Thai ring on the other. Multiple pull-up bars. And everything is on the same floor. I loved it. 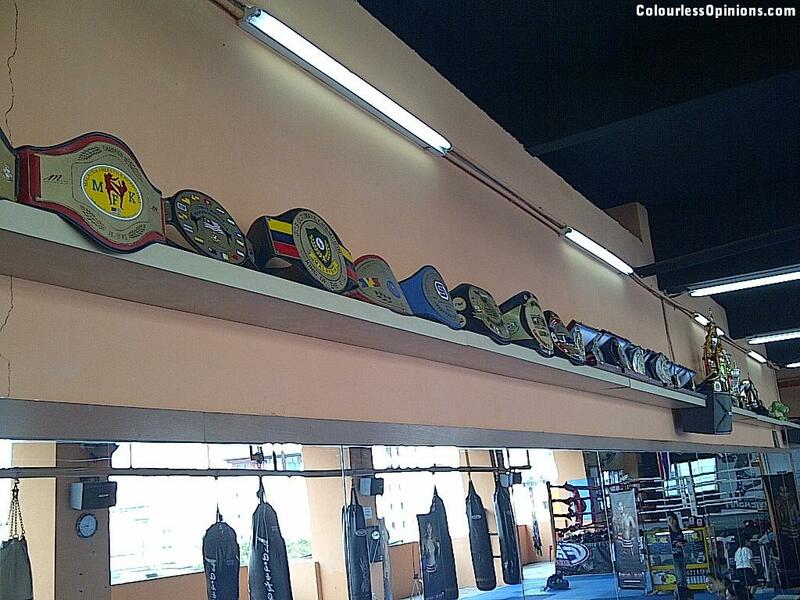 The impressive collection of belts and trophies won by the fighters from Dragon MuayThai Club. are either Malaysians or they can understand English well. And based on my personal past experience, language is very very important in learning martial arts and it doesn’t seem that there’s a problem in that department. It also seemed that the trainers are very friendly, meticulous and patient. There was one time I was being lazy, kicking without raising my heel and Faizal caught me and encouraged me to do the right technique. They don’t have a Thai champion here but if you’re only learning without serious intention of competing, this is the right place to train. Now here’s the down side of this gym – it’s not really for those who wanna learn self-defense on the streets. Muay Thai is a kickboxing sport and many dreadful Muay Boran techniques were banned to reduce fatality of fighters in competitions. Most of the trainers and fighters here were trained only to compete in the ring against another similar kickboxer. Thus, I don’t think any of the classes here will teach the students here how to defend yourself in a genuine dangerous situation against more than one opponent or even a single opponent that has a weapon in hand. I had trained Muay Thai and MMA for nine months but would I have the confidence to fight two or more robbers that have parangs in their hands? No. 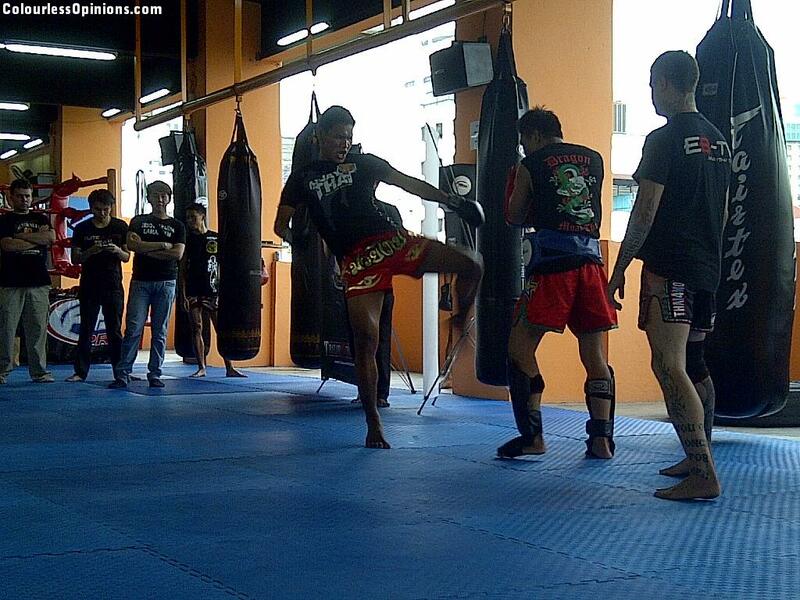 Faizal “Golden Elbow” Ramli working the pads. Both Faizal and Ali were in the midst of training for the Thailand vs Challenger Series: Thailand vs Asia – The Best of Malaysia that will be happening tomorrow night (9 October 2012) at Sunway Pyramid Convention Centre. They will be representing Malaysia to go up against some fighters from Thailand. Aside from that, there will also be some very interesting match-ups such as the Super Fight between Thailand’s Jom Kitti (who I used to learn from at MuayFit) and Brazil’s Leo Monteiro. If you’re interested, please do check if the tickets are still available. Otherwise, stay tuned here ’cause I’ll be covering the event as well. 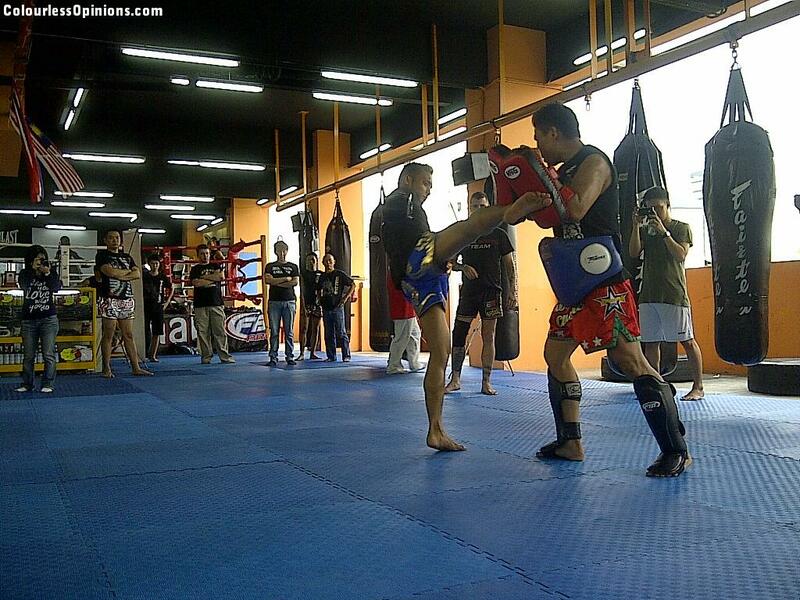 Faisal Ramli light-sparring with Ali Yaakob. I can’t quite recall how much exactly the membership fee was but it’s definitely around RM100 per month. It’s pretty standard these days, I think. However, they currently have a special promotion – sign up for two months and get one more month for free; six-month membership get another six months free; ladies get three months of trial membership for free. Totally worth it for people who stay around the area. I highly doubt there’s any other good Muay Thai gym in KL, with high reputation fighters, can give you a better deal than this. Zidov “Akuma” Dominic explaining to us about how the fighters here train. 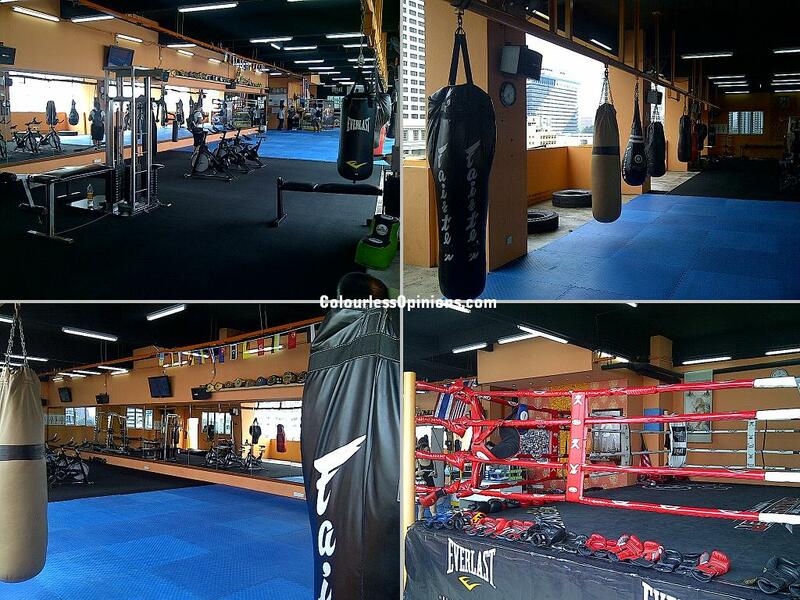 Dragon Muay Thai Club is located on the 4th floor of Wisma City Tower at Jalan Alor, Bukit Bintang in KL. training. You’ll never be hungry here. The trainer dodges a head kick from fellow blogger, Isaac. You is fit… I is unfit. Did u try the Krav Maga at Muay Fit? I understand that with their proper technique u can actually dodge a knife attack or even gun pointing at you. Anyway, the muay thai club is only best for those who stays in KL city area. Best place ever.. They make u feel at home! !